Power to conveniently recharge mobile prepaid accounts AND tightly manage your distribution network! 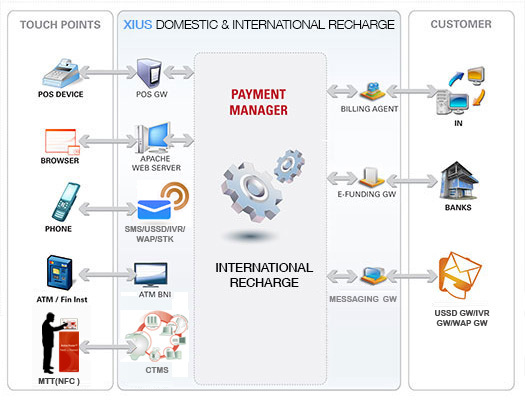 Designed to support the unique payment needs of mobile operators, XIUS Domestic & International Recharge platforms allow creation and management of multiple payment channels from a single web-based user interface. The platform includes real-time payment processing, multi-level settlement capabilities, sophisticated payment loyalty functionality as well as fraud prevention tools. Distribution management, hierarchy, balances, transfers, credits, credit limits, etc. Basic distribution management of balances, credit limits, etc. The pervasiveness of a mobile operator's domestic and international recharge network directly correlates to the top-line!